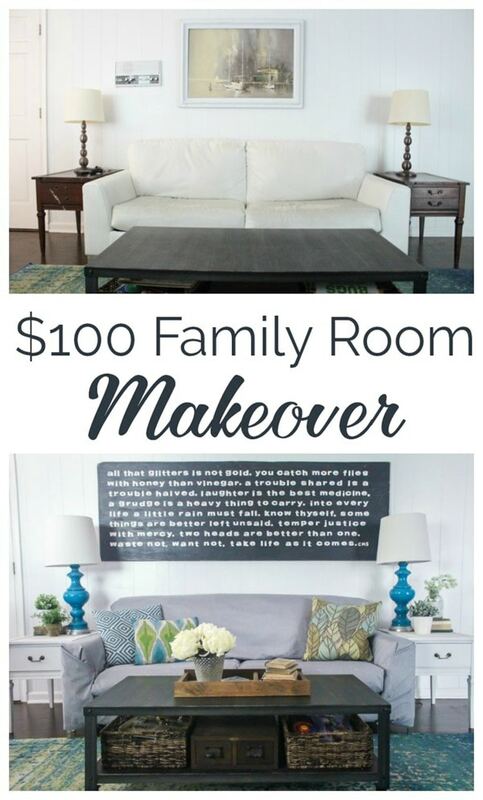 $100 Family Room Makeover Reveal - Lovely Etc. Who’s ready to see how far $100 can stretch? It’s reveal day and I am so excited to share what I was able to accomplish with only $100 in our family room. I’ve spent the past four weeks trying to work some magic in my family room with a miniscule $100 budget. That’s right – a whole room with only four weeks and $100 dollars to work with. Sound crazy? Yeah, it pretty much is. But the $100 room challenge was dreamed up by Erin of Lemons, Lavender, and Laundry and I love a good challenge so I had to join in. Plus, it really helps me get things done! Back in January I finally got myself in gear to transform our main bathroom as part of the $100 challenge. It was a ton of work but now it’s one of my favorite spaces in our house. 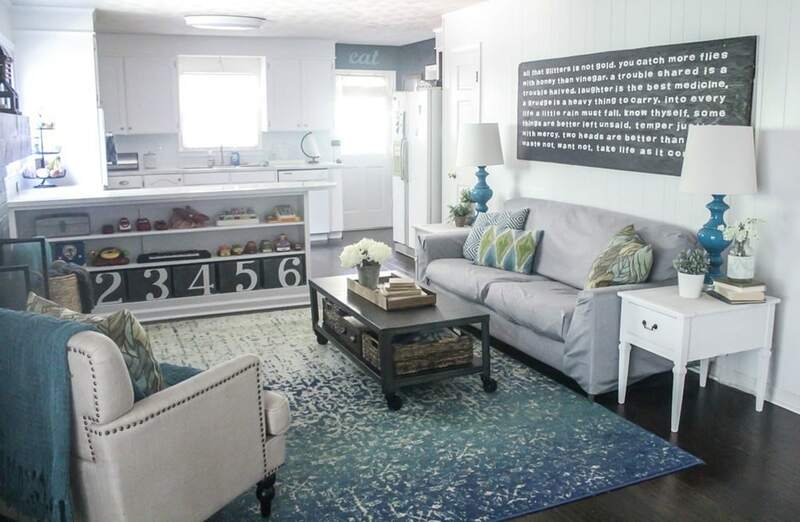 So I decided to tackle the challenge again and this time I set my sights on our family room. We spend most of our time in this room; it’s the room where we do our TV watching, toy playing, blog writing, and yes, far too often we even end up eating dinner in here. So much better! As you can see, I used all the same furniture, the same rug, and kept the same layout. But the details make all the difference. The new fireplace mantel was a pretty simple DIY and it fits the size of the fireplace so much better. This alone made a huge difference in the room. I also added new trim to the built-in shelves to help them look like real built-ins instead of leftover kitchen cabinets. I never realized before just how big a difference a bit of trim can make! There were some big changes on the other side of the room as well. I pulled that crazy 1970s intercom out of the wall, painted the end tables, made a temporary slipcover for the couch, and pulled in different art, lamps, and accessories. That huge awesome sign is a DIY project from several years ago. It’s actually been stored away in the basement for a few years because I didn’t have a wall big enough for it. But then I realized that if I got rid of the intercom, this would be the perfect spot. It looks fantastic up there and also perfectly hides the hole where the intercom used to be. The couch slipcover is a bit wrinkly looking, but it is a huge improvement over the couch before. And it was free! 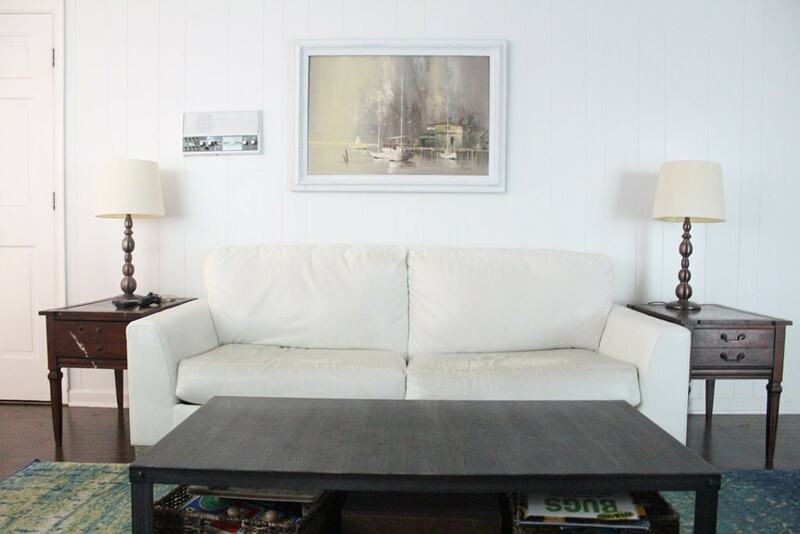 Our white couch has developed a serious peeling problem over the past several months; the faux leather is peeling right off and it looks horrible in person. When I was trying to think of a cheap solution, I remembered these gray curtain panels I wasn’t currently using. I didn’t want to permanently sew them since I will probably use them for something else at some point, so I simply pinned them to the couch. I know this slipcover isn’t perfect but it’s pretty darn good considering it was both free and no-sew! 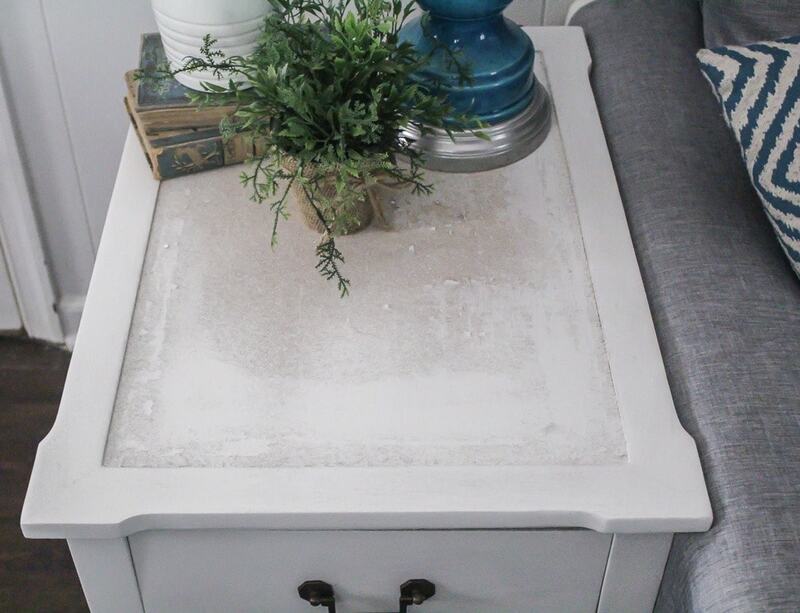 I painted the end tables that were already here white. And since one of the tables was missing the hardware, I changed the hardware placement so I could use one pull on each end table. Unfortunately I did run out of time to finish the tops of the end tables. The tops were originally a weird faux leather that I removed. I have plans to do something cool in the recessed area with paint sticks but haven’t had a chance to do it yet. I did include the cost of the materials in my final budget though. Just barely squeaked in on budget! And with all I managed to accomplish, I definitely count this $100 room challenge as a triumph! Ready to see what everyone else managed to pull off with their $100 budgets? You can see all the reveals at the links below! 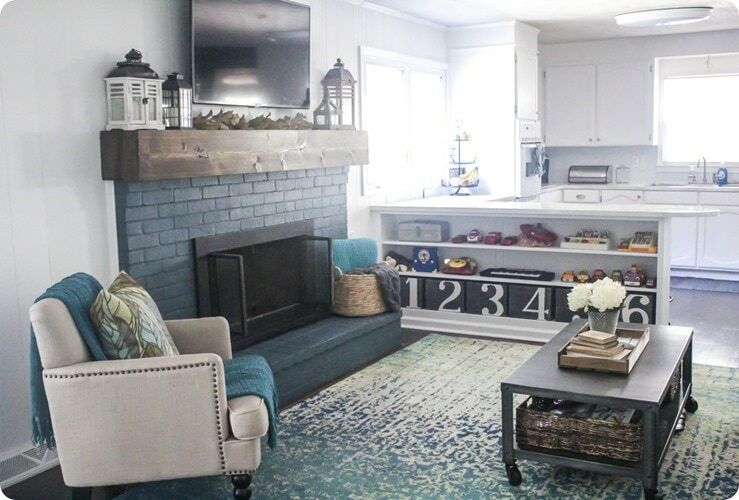 love the thick wood mantle, carrie! it looks awesome! Thanks so much Cassie! I love it too! I’m sure everyone will say this, but love that mantle! Great job!! This looks great! I love those numbered bins. Yeah for DIY! Thank you Gabby! I love those bins too! 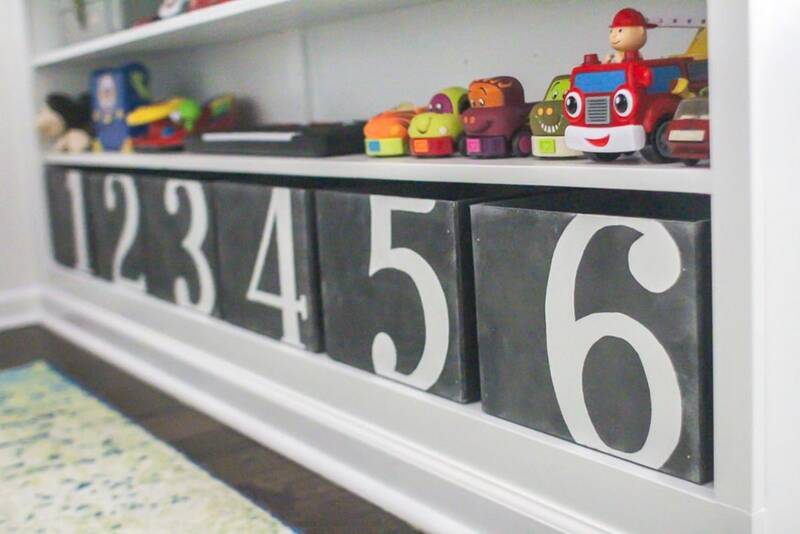 Those numbered bins are amazing! I love how this room turned out. The aqua lamps are so pretty! Yay for big mantles!!! 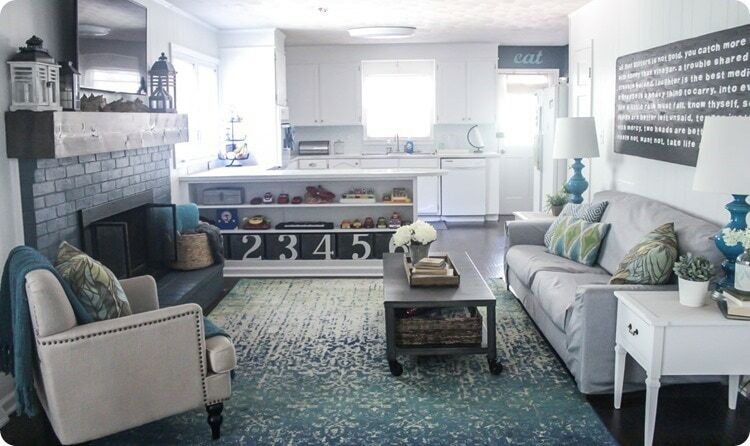 Your details make this room pop!!! Love it! Wow! Those numbered bins are so good! The huge sign is amazing! Everything looks so bright and fresh. Great job!!!! Thank you Melisa! Those are two of my favorite parts of the room as well! i”m totally jealous of your mantel! It looks so fantastic and definitely like you spent way more than you did!!! What you guys did was genius! If I had a fireplace to re-create that I certainly would! But everything in your family room looks perfect! Love how it turned out!! Thank you Brittany! It really is amazing what a little money and some work can do! It’s perfect!! I can’t believe the changes you made for $100. 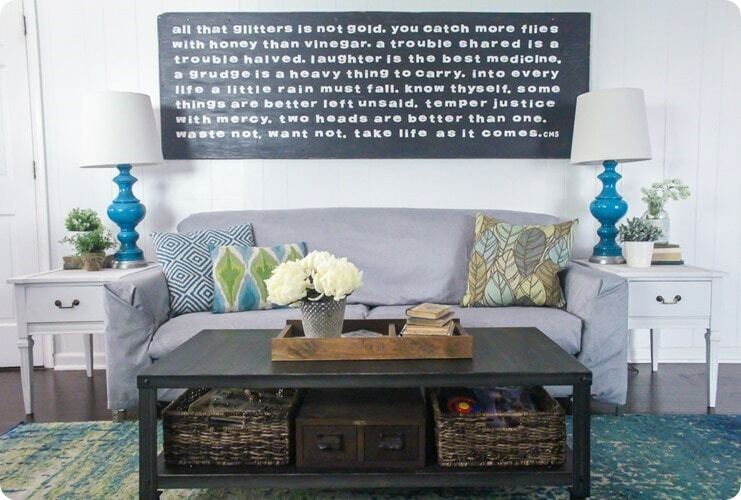 I’m loving that DIY sign above the couch and it fits that space like a glove. Of course I love the mantel, but those DIY bins are pretty fantastic too. Super nice job for $100 and 4 weeks Carrie! Thank you so much Melissa! I’m so happy with it! Stunning makeover!! That mantel is GORGEOUS!!! It looks fantastic! I still love the mantel so much! And the blue lamps are perfect in the room. 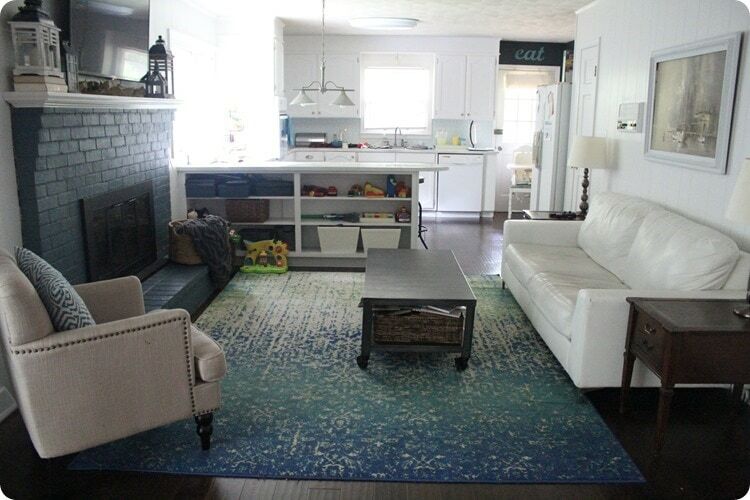 I love the rug! Do you have a link for it?? Thanks Liz! The rug is on Amazon here –> http://amzn.to/2yi1yhi. I got mine on sale from a daily deal site called Zulily and I have seen it for sale at rugsusa for a cheaper price as well. this is such a great example of how much accessories matter. bravo!! Carrie, I think this room is my favorite of this challenge. Seriously, you did A-LOT!! And it’s all awesome. You inspired me on plenty of things and I can’t wait to see your boxes tutorials! I know it was already there, but can you tell me where you got that rug? sooo pretty! Thank you so much Natalie! Honestly, this room was a lot of work – mostly because of the tight deadline but I am so happy with how it turned out! I got my rug for sale at Zulily a few years ago. It is this same one on Amazon – http://amzn.to/2yi1yhi. I have also seen it on RugsUSA which has killer sales every few weeks. 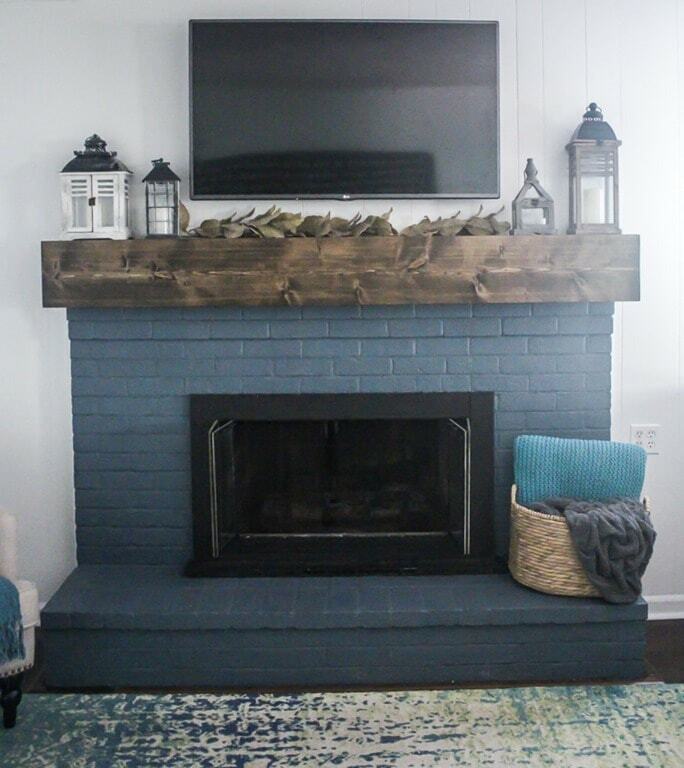 The mantle and trim look amazing! 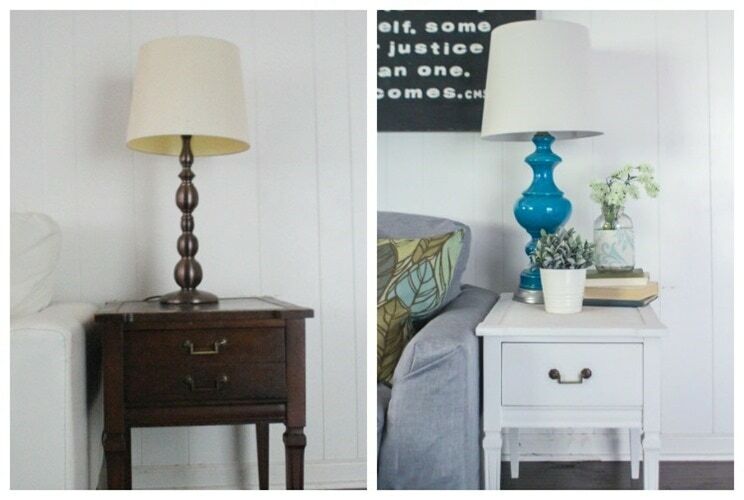 Have you considered some simple potlights to replace the pendant? Thank you Lindsay! The trim is such a small thing but it made such a huge difference! I would really love to put in some small potlights throughout the room but that’s going to require an electrician so it isn’t in the budget right now. Wow–huge improvement! 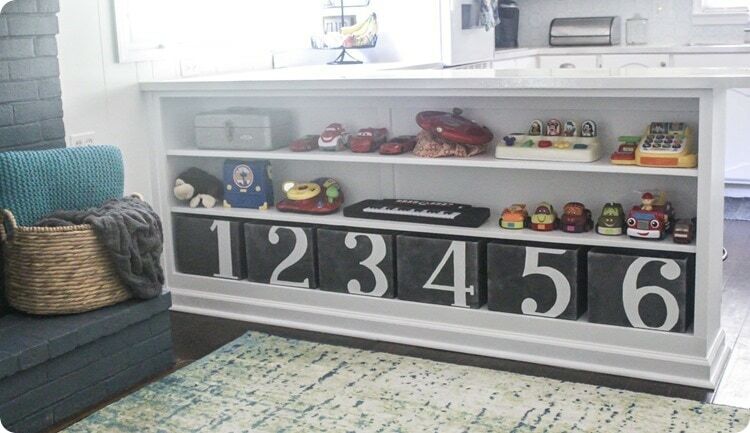 I love the toy bins, and that mantel is definitely stealing the show! Thanks Gretchen! I love it so much! Oh. My. Goodness!!! You did SO much in here: mantel, cabinet trim, pulling out lights and intercoms, wall art, lamps, tables, slip cover!!! I cannot believe you came in only 10 cents over budget (which doesn’t even count as over budget, IMO). I am BEYOND impressed with this room! I also can’t wait to see the paint stick treatment for the tops of the end tables. 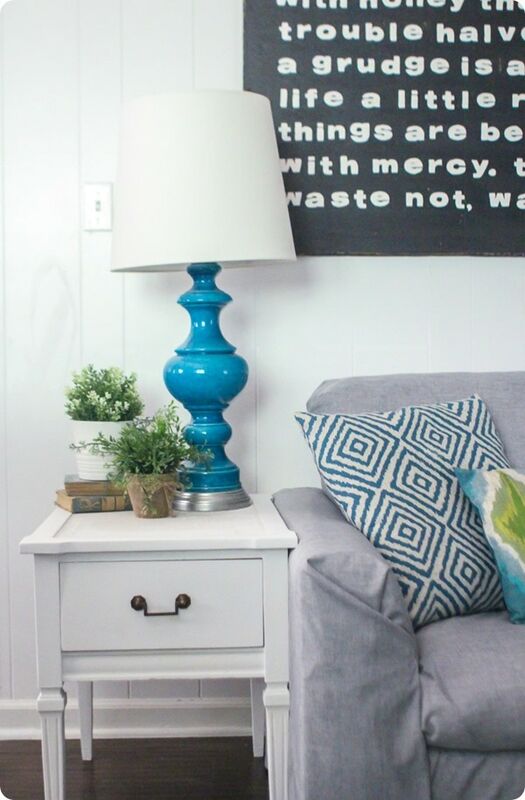 I am SO glad you decided to join another round of the $100 Room Challenge! Thanks Erin! I’m so glad I joined in too. This challenge is such a good idea and right up my ally! 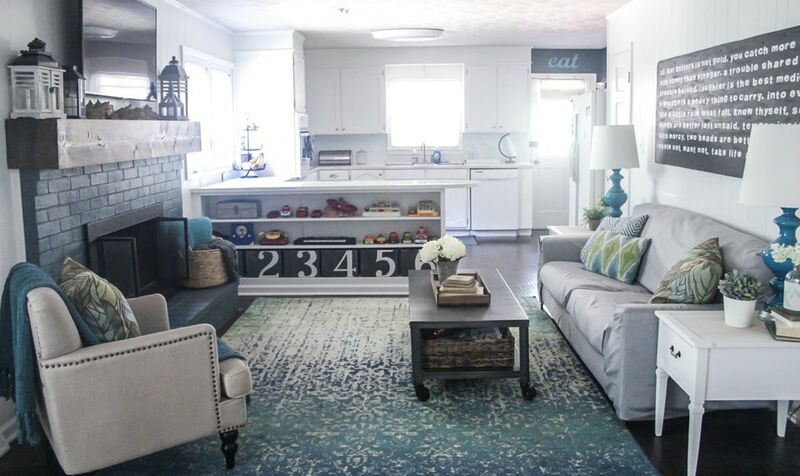 I still can’t believe the transformation in this room! I thought it looked great to start with, but all the changes you’ve made really work together to make it pop! Love the art over the couch, those blue lamps, and especially your new mantle! I love how the cabinet looks now. That trim and those numbered crates make such a difference. 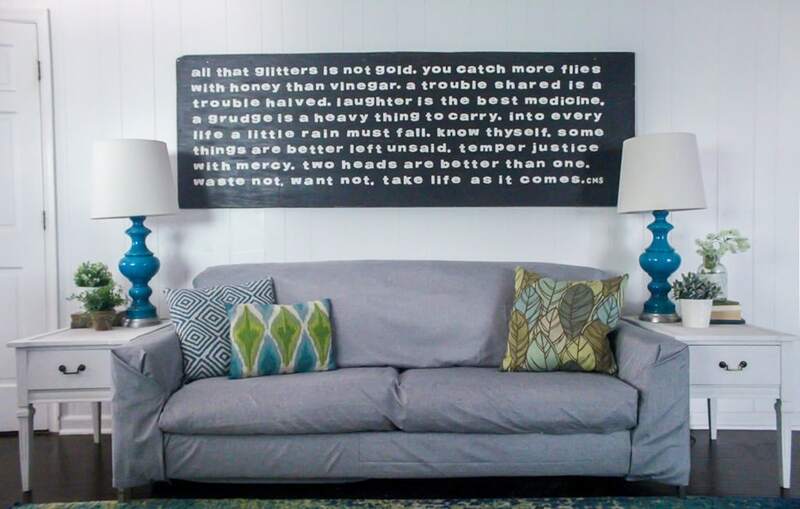 That’s my favorite addition, but the couch and tables look good, too. Thank you so much! That cabinet honestly makes the room feel somewhat finished for the first time. 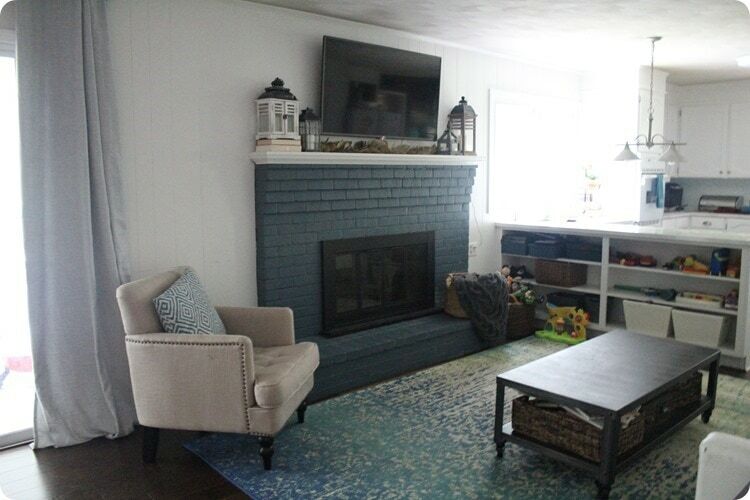 I love the color of your brick fireplace and assume you painted it. I’m painting mine soon. Can you please tell me the specific paint color you used? Thanks!